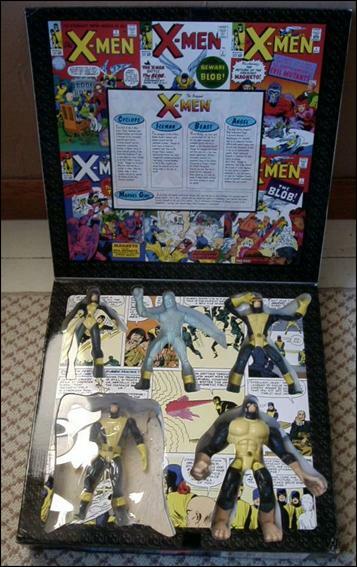 Back in 1997 Toy Biz released the first-ever Classic X-Men box set modeled after the team's debut 1963 appearance in Stan Lee and Jack Kirby's X-Men #1. I loved that set so much that I managed to go through two of them (Angel lost his wings after some dangerous aerial maneuvers, Iceman accidentally shed a few arms, etc.). Some 17 years later Hasbro will assemble action figure versions of the team yet again with its own All New X-Men Marvel Legends Box Set, putting a more modern 6" spin on the blue and yellow-suited lineup of Cyclops, Jean Grey, Iceman, Angel and Beast. The figures in the box set appear as they did in 2012 when they were (re)introduced in the time-traveling adventures of All New X-Men by Brian Michael Bendis and artists including Stewart Immonen, David Marquez and Brandon Peterson. The team's since switched to a more individually-colored set of contemporary suits, which could very well find their way into Hasbro's Infinite action figures lines in either the 3.75" or 6" scales down the road. For now fans can expect to grab this box set for $84.99 exclusively at Toys 'R' Us stores in February.